Thank you to all attendees, authors, committee members and chairs, and volunteers who made IST 2014 a success. IEEE is the world’s largest professional association, with nearly 500,000 members , dedicated to advancing technological innovation and excellence for the benefits of humanity. IEEE creates and promotes advancement of knowledge and world-changing technologies from computing and aerospace, to medical devices, healthcare, telemedicine, communications, sustainable energy systems, nanotechnology, robotics, and more. Following the success of events in Stresa, Italy 2004, Niagara Falls in Canada 2005, Minori in Italy 2006, Krakow in Poland 2007, Chania in Greece 2008, Shenzhen in China 2009, Thessaloniki in Greece 2010 Penang in Malaysia 2011, Manchester in the UK 2012, and the recent success in Beijing in China 2013, the 2014 IEEE International Conference on Imaging Systems and Techniques (IST 2014) and the IEEE International School of Imaging (I2SI) will take place in Santorini Island, Greece. 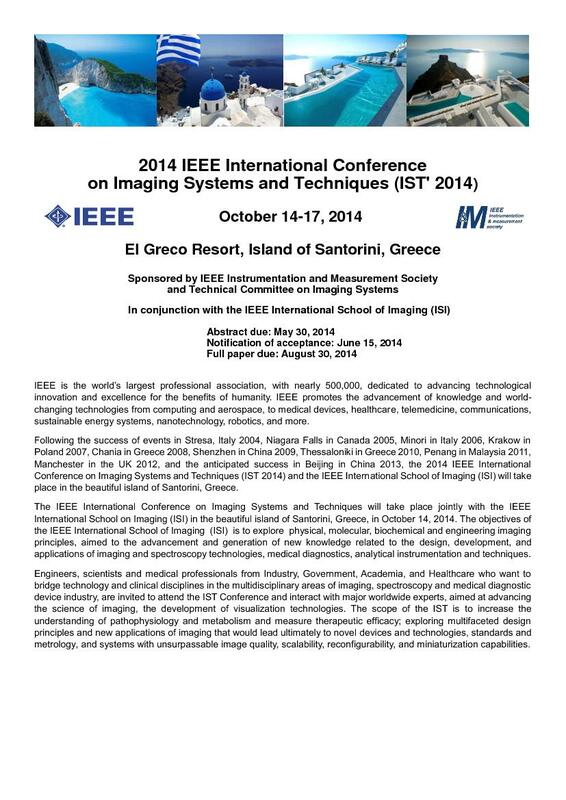 Engineers, scientists and medical professionals from Industry, Government, Academia, and Healthcare who want to bridge technology and clinical disciplines in the multidisciplinary areas of imaging, spectroscopy and medical diagnostic device industry, are invited to attend the School and interact with major worldwide experts, aimed at advancing the science of imaging, the development of visualization technologies, to increase the understanding of pathophysiology and metabolism and measure therapeutic ecacy of drugs; remote sensing, space instrumentation and material characterization; exploring multifaceted design principles and new applications of imaging that would lead ultimately to novel devices and technologies, standards and metrology with unsurpassed image quality, scalability, recongurability, and miniaturization capabilities.